Video Column and Video Web Part are powerful controls made for uploading, managing, linking and playing video files. 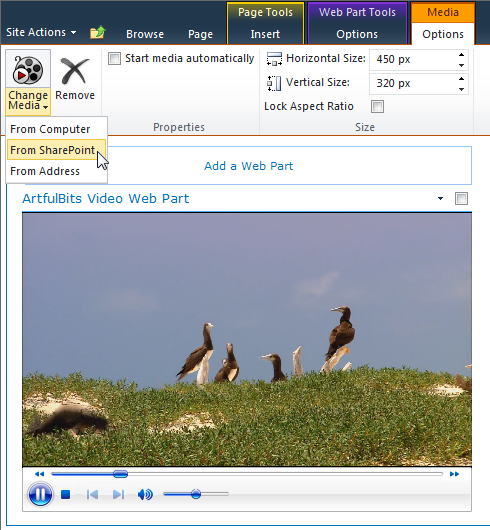 These controls support variety of video files that can be uploaded from computer, or linked from SharePoint library or streamed from direct URL. Standard SharePoint Media Web Part and Media column presents only in SharePoint Server and can be used only to play WMV video and WMA, MP3 audio files. Standard SharePoint Media Web Part and Media column presents only in SharePoint Server and can be used only to play WMV video and WMA, MP3 audio files. ArtfulBits Video allows you easy to organize your rich media the way it was meant to be. How to use ArtfulBits Video Web Part? * From Computer - allows upload a file from your computer. * From SharePoint - open File Picker dialog box through which you can select a video file from SharePoint Document Library, such as Assets Library, of any site within site collection. Qweas is providing links to Video Column and Web Part 1.1 as a courtesy, and makes no representations regarding Video Column and Web Part or any other applications or any information related thereto. Any questions, complaints or claims regarding this application Video Column and Web Part 1.1 must be directed to the appropriate software vendor. You may click the publisher link of Video Column and Web Part on the top of this page to get more details about the vendor.